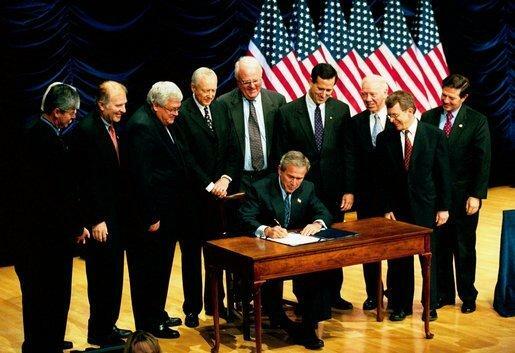 President George W. Bush signs the partial birth abortion ban in 2003, the last time an abortion procedure was prohibited in the U.S.
"The D&E procedure is endorsed as the safest method of second trimester abortions," says Laura McQuade, president of Planned Parenthood of Kansas and Mid-Missouri. "For Kansas politicians to think it's in their purview to override that kind of medical science is just astonishing." The World Health Organization and the American Congress of Obstetricians and Gynecologists both acknowledge D&E as the safest second trimester option. But while Planned Parenthood was working the medical angle, a group called Kansans for Life was winning in the court of public opinion. Kathy Ostrowski, the group's legislative director, says they embrace the term "dismemberment abortion" because it is more informative than D&E. "A doctor wouldn't say we're going to disarticulate your limb, they'd say we are going to have to break this bone and reset it," says Ostrowski. "When you're examining these kinds of procedures, it's important not to obscure it in language that the public can't understand." This is only the second time that a medically sound abortion procedure has been prohibited in this country. Intact dilation and extraction, or D&X, was banned by Congress in 2003, a decision upheld by the Supreme Court in 2007. But D&X got another name too, courtesy of the National Right to Life Committee: "partial birth abortion." Using a provocative name and explicit descriptions helped to influence the conversation back then. David Garrow, a law professor at the University of Pittsburgh who studies abortion, says this new Kansas law is the clear next step in a plan that emerged years ago. "The quite correct realization that abortion opponents had was that they could only successfully attack abortion rights at the margins, not head on." Ten years ago, those margins were late-stage partial birth abortions. Now that those are banned, abortion opponents are taking on second trimester abortions. But where partial birth was a rarely used procedure, D&E accounts for about nine percent of all abortions performed in Kansas, and is typically done earlier. "It is clearly pre-viability," says McQuade. "The constitutional standard still says viability." Planned Parenthood will work with Kansas' other two abortion providers to consider legal action. "It's really important that we get this right," McQuade says. "Kansas is a bellwether state. These laws, once they're introduced, tend to repeat themselves." From her lips to Oklahoma's ears. Governor Mary Fallin signed a similar bill into law on Monday.